1. Soak rajma(red kidney beans) overnight. 2. Cook rajma in pressure cooker. Drain. 3.Heat oil Chopped onions and saute till onions are golden brown in colour. 4.Add ginger chilli paste cook for minute. 5. Add redchilli powder, coriender powder, turmeric powder,cumin powder and stir. 6.Add chopped tomatoes and cook till tomatoes are cooked in oil leaves masala. 7. 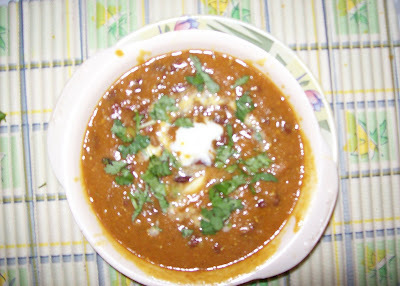 Add boiled rajma with its cooking and cook on a low flame for 15 minutes. Add salt nad cook for few minutes. 8. Garnish with chopped corriender. served wiht hot steamed rice.